The Eleventh Circuit Court of Appeal’s recent decision in Johnson v. Royal Caribbean Cruises Ltd., invalidating releases for activities on cruise ships, which was participated in by Leesfield Scolaro‘ Robert Peltz as amicus curiae on behalf of the Florida Admiralty Trial Lawyers Association, is an important decision protecting the rights of cruise ship passengers, who are injured as a result of the negligence of cruise ships and their crew. 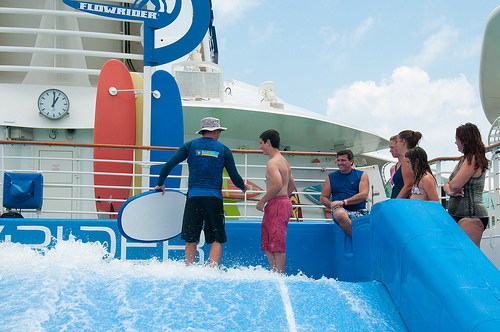 Although RCCL centers much of its advertising around the FlowRider and other similar activities on its ships, it requires passengers to sign releases discharging it from all liability in participating in these activities, even for the negligence of its ship and crew. In Johnson, RCCL convinced District Court Judge Moreno to throw out Ms. Johnson’s case based upon the release, which she was required to execute. As a result, she never had the opportunity to have her case heard on its merits. Ms. Johnson appealed the District Court’s ruling to the Eleventh Circuit Court of Appeal in Atlanta. Leesfield Scolaro filed its amicus brief in support of Ms. Johnson’s appeal, in which it argued that a Congressional statute, 46 U.S.C. §30509, prohibited cruise ship operators from trying to evade responsibility for their negligence by requiring passengers to sign such disclaimers and releases. The amicus brief further argued that Royal Caribbean’s attempt to construe the statute in such a way as to make it inapplicable to recreational activities occurring aboard cruise ships violated both the wording of the statute itself and Congress’ intent. The appellate court agreed with this argument, holding that the statute prevented cruise ship operators from requiring passengers to sign the releases, which would relieve the company from liability for its own negligence as a condition to participating in the shipboard activities. The court’s opinion will play an important role in protecting the safety and legal rights of passengers sailing aboard cruise ships. Although the cruise lines spend millions of dollars to create compelling advertisements enticing passengers to sail on their ships and to enjoy their entertainment and port excursions, they hide the fact that they simultaneously use legal technicalities buried in fine print to have the passengers sign away their legal rights to recover for injuries negligently inflicted by the ship or its crew during the course of these activities. In order to offer some measure of protection to the consuming public, Congress enacted legislation prohibiting certain of these practices. Over the years, cruise lines and their lawyers have attempted to circumvent the provisions of the statute in various ways in order to deprive injured passengers of having the opportunity to have seek their day in court. Many of these tricks have been rejected by the appellate courts through the vigilance of passenger’s attorneys, who fight hard to protect their client’s rights.